Each player may build each building only once. When at least one colonist is in the building, it is considered occupied. Only occupied buildings have any value. A building is placed on an empty city space. A large building requires two adjacent empty city spaces. Where a building is placed in the city has no bearing on the game. A building may be moved within the city to make room for a large building. 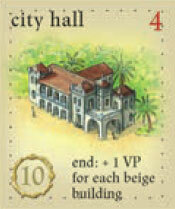 However, as with the plantation and quarry tiles on the island, a player may not remove a building from his city. The red-brown number in the upper right corner of each building indicates how many victory points the building is worth (occupied or unoccupied) at the end of the game. The number in the first circle is the cost to build the building. Once built, the building cost has no further role in the game. In the indigo processing plants, the indigo plants are processed to produce indigo dye (blue goods barrels). In the sugar mills, the sugar canes are processed into sugar (white goods barrels). In the tobacco storage, the tobacco leaves are shredded into tobacco (light brown barrels). In the coffee roasters, the coffee beans are roasted into coffee (dark brown barrels). Note: there is no production facility needed for the corn. Corn (yellow barrels) come directly from the plantation without any need for processing. That means that, in the craftsman phase, occupied corn plantations produce corn (yellow barrels) directly. The number of circles on the production buildings indicates the maximum number of goods the building can produce when the circles have colonists on them. Of course, the player must also have sufficient occupied plantations of the appropriate kind to produce the raw materials needed to produce the goods in the production buildings. There are 17 different violet buildings: two each of the 12 small buildings and one each of the 5 large buildings. The special functions of the violet buildings tend to allow players to break the normal game rules. So, for example, the owner of an occupied office may sell a kind of goods to the trading house that is already there. A player is not required to use the special function of an occupied violet building if he does not want to (important with the wharf, see below). When the owner of an occupied small market sells a good in the trader phase, he gets an extra doubloon from the bank for it. Example: Anna sells a corn and receives 1 doubloon. 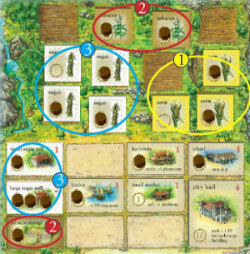 On his turn in the settler phase, the owner of an occupied hacienda may, before he takes a face-up plantation tile, take an additional tile from the face-down stack (the top-most) and place it on an empty space on his island. He may then take his normal turn in the phase. Note: if a player chooses to take a face-down tile, he must immediately place it on an empty space on his island. He may not discard it. If the player also owns an occupied construction hut, he may not take a quarry instead of the face-down tile. Thus, if the settler owns a hacienda, he may only take one quarry. In the settler phase, the owner of an occupied construction hut, can place a quarry on his island instead of one of the face-up plantation tiles. Note: if the settler owns a construction hut, he may only take one quarry. As described under the captain, players must store their unloaded goods at the end of the captain phase. If a player does not have sufficient storage space, he must return the goods to the goods supplies. The owner of an occupied small warehouse may store, at the end of the captain phase, in addition to the single goods barrel he is allowed to store on his windrose, all the barrels of one kind of goods that he chooses. The warehouse protects the player from returning goods to the supply. It does not protect the player from being required to load the goods onto the cargo ships. Note: the goods chosen are not actually stored on the small warehouse tile, but onthe player's windrose. Note: if the player also owns an occupied hacienda and chooses to take the additional face-down or quarry tile, he does not get a colonist for the extra tile. If there are no more colonists in the colonist supply, he may take one from the colonist ship. If there are also none there, he goes without. When the owner of an occupied office sells a good to the trading house in the trader phase, it need not be different than the goods already there. If the trading house is full, the player cannot sell a good there. Example: the trading house already has a barrel of tobacco. Bob owns an occupied office and, on his turn, sells a tobacco to the trading house. Chris owns the other office. On her turn it is occupied, so she too can sell a tobacco to the trading house. The owner of an occupied large warehouse may store, at the end of the captain phase, in addition to the single goods barrel he is allowed to store on his windrose, all the barrels of two kinds of goods that he chooses. Example: David owns an occupied factory, 3 occupied corn plantations, 3 occupied sugar plantations, 1 occupied tobacco plantation, and the associated production buildings with the necessary number of colonists. He produces only 2 sugar barrels and 1 tobacco barrel as there is no corn and only 2 sugar barrels in the supply. He earns 1 doubloon from the bank for producing 2 kinds of goods. Note: if he builds a production building with more than one circle, he gets only one colonist. If there are no more colonists in the colonist supply, he may take one from the colonist ship. If there are also none there, he goes without. Each time, during the captain phase, the owner of an occupied harbor loads goods on a cargo ship, he earns one extra victory point. Example: the owner of an occupied harbor (and an occupied wharf) can only load 3 of his 5 tobacco on the "tobacco ship" as those 3 fill it up: he earns 3+1 VP. In his next loading turn, he loads both his 2 sugar on the "sugar ship": he earns 2+1 VP. In his next loading turn, he uses his wharf to put his remaining 2 tobacco in the supply: he earns 2+1 VP. Thus, in this captain phase he has earned an additional 3 VP with the use of his harbor (and 2 VP extra with his wharf). During the captain phase, when a player with an occupied wharf must load goods, instead of loading them on a cargo ship, he may place all goods of one kind in the goods supply and score the appropriate victory points as though he had loaded them on a cargo ship. It is as though the player has an imaginary ship with unlimited capacity at his disposal. The wharf can only be used once per captain phase by its owner, but he may choose when to use it, if at all. This imaginary ship can take any one good, but it may be of a kind on one of the three cargo ships or the other imaginary wharf ship. Note: when a player uses his wharf, he must load all the goods barrels of the kind he chooses that he has. He is not required, however, to choose the good he has the most of. An imaginary wharf ship has the capacity for 11 barrels. The following five large buildings occur just once each in the game. Each needs two adjacent city spaces to be built, but it counts as one building. Note: when, in these rules, "large building" is mentioned, it is the following five buildings that are described. 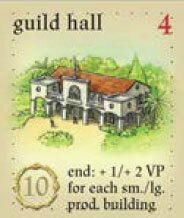 The owner of the occupied guild hall earns, at game end, an additional 1 VP for each small production building (occupied or unoccupied) in his city (=small indigo plant and small sugar mill), and an additional 2 VP for each large production building (occupied or unoccupied) in his city (= indigo plant, sugar mill, tobacco storage, and coffee roaster). Example: at game end, the owner of the occupied guild hall also has a small and large sugar mill, a small indigo plant, and a coffee roaster in his city: he earns an additional 6 VP. 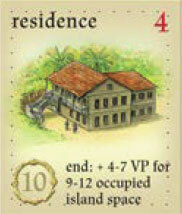 Example: at game end, the owner of the occupied residence has filled 10 of his 12 island spaces with plantations and quarries: he earns an additional 5 VP. 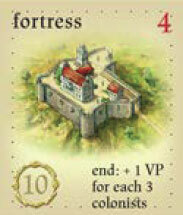 Example: at game end, the owner of the occupied fortress has a total of 20 colonists on his plantations, quarries, buildings, and in San Juan: he earns an additional 6 VP. The owner of the occupied customs house earns, at game end, one additional victory point for every four victory points he acquired during the game. The player should count only his victory point chips (and any extra victory points recorded on paper after the chip supply was exhausted, but before game end). He does not use victory points earned for his buildings at game end. Example: at game end, the owner of the occupied customs house has accumulated 23 victory points in VP chips: he earns an additional 5 VP. The owner of the occupied city hall earns, at game end, one additional victory point for each violet building (occupied or unoccupied) in his city (city hall counts). 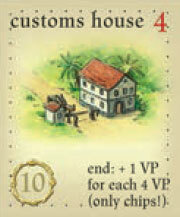 Example: at game end, the owner of the occupied city hall also has: hacienda, harbor, office, construction hut, large warehouse, and residence: he earns an additional 7 VP.